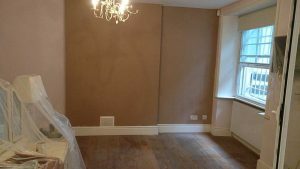 Following our clients purchase of a property, Kenwood were called to carry out treatment for Rising Damp. Rising Damp is caused when the damp proof course become defective or bridged. Older properties were built with a slate damp proof course, which while impervious to moisture, can over time crack and allow moisture to rise up. 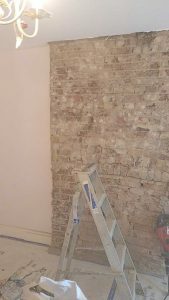 Treatment for Rising Damp is carried out in three stages; firstly the removal of the wall plaster to remove contaminates and to reveal the brick work. The mortar course is then injected at intervals until impregnated with a chemical damp proof course. The walls are then replastered and skim finished, after a period of around a month the walls can be redecorated using non-vinyl paints.